I'm still playing this. I'm up to level 437 in the regular world, and level 131 in Dreamworld. They recently updated the game so that the regular world and dreamworld each have their own set of turns, up to 5 each, so you can switch worlds and keep playing after exhausting your turns in one world. I typically play once or twice a day during my commute, making sure to spin the free booster wheel. However, the later levels are getting much harder to pass, especially without using boosters. Yeah. I still play it too and have never spent a dime on it. I have drifted away from playing games on my tablet and phone but CCS is the only thing I still play on an occasional basis. I am somewhere around level 260 on my phone. I'm still stuck in the early 100's. 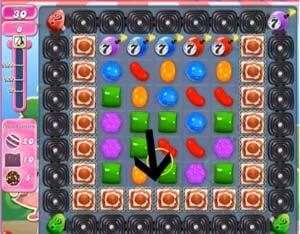 It's the first level where you have to clear 100 red,yellow, and orange candies. Even with all the free boosters, I don't get anywhere close to winning I've since switched over to Monster Busters, a similar game, that scratches the same itch for me. I think I'm at 256. There was a level recently that I sat on for a few months. I used to play everyday, sometimes twice, then that level came along. After a month of trying, I changed to only playing every few days, then once a week. I finally passed it, but haven't returned to my previous frequency of playing. I have been stuck on level 566 and it is nearly impossible so I have just gone back and played older levels. Here is a pic of what the start of 566 looks like. Now on level 475 regular world and 145 Dreamworld. After an update a while back, the map zoomed out and I'm unable to zoom in. They also added a button for gold bars to the main map, above the booster wheel. I've been having trouble with logging into Facebook on the Android App recently. It seems to lose my Facebook login often, requiring me to re-login often. I thought it was an issue with the app, so I cleared the data and re-logged in, but it still happens. A side effect of wiping the data though was all my boosters got wiped out; I would've thought those would sync with my Facebook account like the levels do. I'm on level 287 or thereabouts... I never had a FB account until I had to create a dummy account recently --- for this freaking game. I couldn't do the wheel spin unless I was logged in and I never had that issue until two weeks ago. Yeah, I have a dummy Facebook account for all the games I sync with it too. I think the requiring Facebook for the booster wheel is likely to try and stop cheating, since the Facebook server can make sure it only gives one booster per account per day. I'm guessing people may have been logging out of Facebook on the app, getting the booster both on Facebook and on the app, then re-syncing the app. I'm now up to 649, and 170 Dreamworld. Progress has slowed because I'm also now playing Candy Crush Soda Saga, up to 352. Candy Crush Saga has introduced a new, limited time, bonus where you have to match so many candies of one color within the time period (typically a day or more) to earn bonus gold, powerups, or both. I've been using level 252 for this, since it's a timed level that basically becomes endless once you clear all the blocks, since the powerup and +5 sec candies come fast and furious. I typically have to deliberately stop playing the level in order for it to end. I'm stuck on level 347 and have been for a long time now. I used to play it all the time but I have basically quit the game since being stuck. I won't pay for any power ups and the few freebies I get won't get me past that level. Great game but it stinks when you can't seem to get past something. Most levels I have been able to come back and beat but not this one. Level 406 on Candy Crush and level 147 on Soda Crush. I prefer the gameplay on Soda Crush but both are nice diversions for 5 or 10 minutes. Some levels are still taking days / complete luck to complete --- which is nonsense. I just finished level 950 on Saga and am waiting for them to add new levels. I am on level 293 on Soda and still working my way through it. It looks like it's been around since April, but they're rolling it out slowly to users. Been playing this a tad more lately and on level 434 (or thereabouts) I cleared the level at 126k points... by the time my game actually ended (ie all the striped candy / power ups were used up) I had crossed the 1 million point threshold. It took no less than 2 minutes for everything to clear and I think there were roughly 9 "sprinkled donuts" created in all the mayhem. My iPad actually tried to shut down automatically twice while the points tallied. I don't know if King games keeps track of overall high scores, but I've never been close to 1M points on any level -- let alone eclipse it. Level 252 is a good one to get a high score. Once you clear all the blocks, the level is basically unlimited, since you can typically easily grab additional +5 sec blocks well before the timer counts down to zero. My high score on that level is about 9,800,000. This site has a leaderboard with publicly posted scores, although the scores appear to be based on the honor system (you enter them in yourself). I'm on level 773 in CCS, 205 in Dreamland, and level 475 in CCSS. I've "beaten" CCSS a few times now, in that I've beaten the last level available up until they release more. Currently, the final level is 480, so I'm only 6 levels away, but 475 is hard. I think there were roughly 9 "sprinkled donuts"
They're officially called "color bombs" and are supposed to be chocolate balls covered in sprinkles. I'm now on level 986 in CCS, 227 in Dreamland, and level 590 in CCSS. I no longer need tickets when advancing to the next "episode" in CCS. So no more waiting 3 days for the next episode to unlock. From what I can find, apparently this happens once you reach level 936 or so. Level 1193 is a super pain in Candy Crush. I've been stuck on it for several attempts. Two new game modes will be introduced; Jelly and Boss. In Jelly Mode, players must match candies and jellies in sequence to complete a level. In Boss mode, players can test their skills against the Jelly Queen and her minions. The game [currently contains] 120 new levels set in the Candy Kingdom. iOS, Android, and Windows Store versions available. This is the game that finally convinced my mom that the iPad Air 2 I bought her for Xmas was better than the iPad 2 she had. Gotta ask -- has ANYONE ever hit Jackpot on the spinny wheel thing? In what, 2 or 3 years of playing this gd game, I've never hit it. I don't think it's even possible. I hit it once. It wasn't even impressive. I think it was one of each thing on the wheel. Maybe three of each.